This is Day 3 of my 31 Days of Grace series that I am writing as a part of the #Write31Days Challenge. 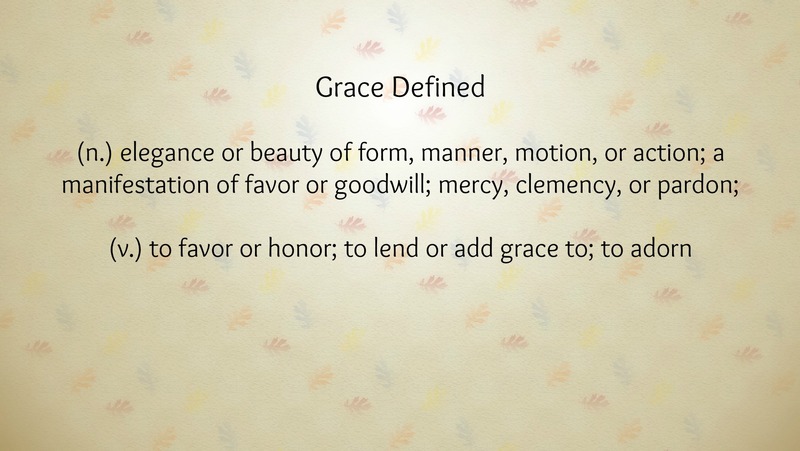 What is grace, exactly? It can mean many different things. As a young girl, my greatest wish was to be graceful. Grace (in a physical sense) has never come easy to me. I have never been an athlete or a great dancer, and to this day I refuse to attend a Zumba class with a good friend of mine for fear of embarrassment. I did take ballet as a child, and the basic ballet stance of standing with your ankles touching and your feet sticking out in opposite directions has stuck with me. Most full-length pictures of me growing up feature me standing in that pose which, considering that I have had size 10 feet since the age of 8, portrays me as an awkward, duck-like adolescent. Even now, I find myself standing at the kitchen sink washing dishes in my duck-pose. Jason finds it pretty amusing. Sensing that I would never be the graceful, swan-like creature that I strived to be, I attempted to capture grace through my clothing. This was difficult to do as a child growing up in the 80’s and 90’s in the foothills of North Carolina. Those were difficult decades, fashion-wise, and grace just couldn’t be achieved with neon yellow tube socks or ripped, baggy jeans. At least not for me! I continued my quest throughout college, again failing miserably to achieve what I considered to be the attribute of grace. Once, I bought a blue silk polka dotted blouse, thinking it was so graceful and elegant-looking. And it was-for the Golden Girls! I held onto it for years, never wearing it but just looking at it every so often and thinking how delicate it looked. As I grew into a twenty-something woman and really into my thirties, I stopped trying to be graceful. I became comfortable in my skin and learned that grace can be portrayed in many different ways. Grace became more of an expression of love and kindness and gentleness of heart. It has occurred to me that grace is showing patience in difficult situations, and that type of grace is reflected in a truly beautiful way. Looking back at myself as a girl, I wish I had shown myself a little grace, a little mercy. I know, though, that in God’s magnificent plan (His never-ending grace), my search for grace grew me into the woman that he intended me to be, duck-feet and all. This is great! We are so hard on ourselves sometimes! Showing a little grace and mercy to our younger selves help make us better women I think!